Because of a planned scope change I have also changed focuser systems to the Optec FocusLynx (focusboss) system, which has temperature compensation. Because I a moving to a longer focal length scope I’d like to try temperature compensation because of the higher demand placed on focusing during long exposures. My question is general in nature: do you find temperature compensation alone works well, or do you also use some kind of auto focus (like every x frames) in addition? For those using the FocusLynx, how hard is it to get an accurate temperature coefficient set up properly? I use an Optec Gemini focuser and make extensive use of its temperature compensation routines. Since TC is enabled in the ASCOM driver, it can be enabled at the beginning of the night and run continuously all night. However, I use SGP’s auto focus routine to perform auto focusing on a regular basis. Basically, SGP gets a good focus at the start of a sub and the auto TC maintains that focus during the exposure. When taking 30 minute narrow band images, the TC keeps the frame in focus during that 30 minutes. On a night of rapid temperature drop, a sub can easily drift out of focus during a long exposure. With my focuser and my 12" Meade LX850 OTA, the temperature compensation is around +800 steps / degree C. With my 130mm APO, the TC is about -275 steps / degree C. These numbers are atypically large due to the very small step size of my focuser. 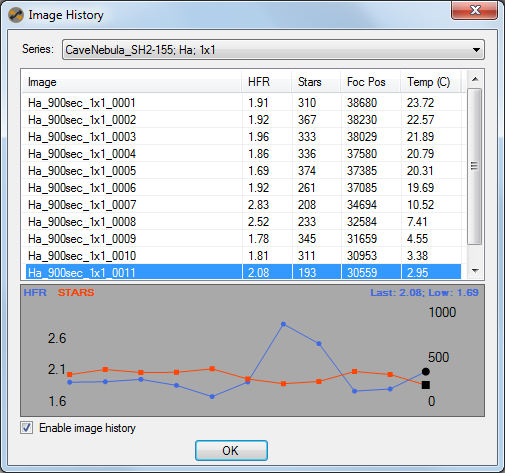 The data maintained by SGP’s Image History can be used to calculate the temperature compensation value for your focuser. For me, this has proven more accurate than using the various TC wizards in SGP and in Optec’s software. One note – be sure to protect the temperature probe from wind. Wind will cause the temperature reading to fluctuate randomly. Getting a really accurate temperature compensation value will require some effort. compensation and autofocus is necessary. steps based on the temp change and focuser position in the log. I’m no expert but COULD it be possible for the temp sensors inside the motor housings to give you a false reading ? The motors are likely to warm up especially after a bit of slewing which could increase the temp in the housings. I haven’t even used the motors yet so I don’t know how the temp sensors will behave. Initial tests are very promising. Also, are you confusing slewing motors with focuser motors? I can’t imagine that the little bit of movement for focusers would affect the temp that much, especially since I will be starting roughly in focus on most nights. you will sure see the two figures getting further and further apart over time if warmth within the casing is playing a part. I have the FBII and am using it on a Tak FSQ 106. These scopes are notorious for rapid shifts in focus with temperature change. I’ve seen one fellow set his refocus routine for every 0.2 degree temperature change for the Tak. Kind of extreme in my opinion. I just set mine for 0.7 deg temp change and forget it. For me, it has worked well and I’m not spending time trying to get the temperature comp settings…Just a matter of how much time and trouble you want to go thru. SGP’s focus algorithm is outstanding and I have very nice v shaped curves since going to the posidrive motor. I’ve got to hand it to the guys at SGP for coming up with the focus algorithm. For my longer f/l scope, the Optec tcfs focuser requires very little in the way of refocus and I’m able to image throughout many nights with few refocus routines being used. Still, I will set the refocus routine for 5 degree temperature change just to be on the safe side. Gunny, are you saying you use temp comp on the Optec focuser with your longer focal length scope, or that the scope natively does not exhibit much focus shift due to temperature? Perhaps I am thinking about this the wrong way. I have always used refractors and the SGP autofocus routine works wonderfully giving me nice V curves. But even with my 6" refractor (1200mm) over the course of a 30min exposure I would notice some slight focus shift that was present in the resulting image. I had assumed that moving to a 2000mm focal length, high end RC, would be even more demanding in terms of focus shifts throughout a long exposure. Hence my desire to use temp comp. But perhaps the scope itself will hold focus better than I imagine. Unfortunately I won’t have the scope for several months in order to test. My 12.5" AGO iDK scope has a native f/l of 2127mm and an focal ratio of 6.7 and I do not use temperature compensation on that scope or the FSQ. Seldom do I have to change the focus much on the AGO during an imaging session but I still have a focus routine set up in SGP for refocus with a 5 degree temperature change. Even with this big of a delta t, the focus point is not that far removed from where it was originally focused in terms of steps ( 3um steps). This is one of the features of the AGO scopes that is frequently remarked on in various forums. I often use nb exposures of 30 min. on the AGO and FSQ scopes and they do not seem to suffer from not having temp compensation. The FSQ is a whole other story due to the ota being aluminum and I would imagine yours will be similar in construction. For myself, I just wanted to get out there and image. Spending the time getting the data for temp compensation just wasn’t a priority and I imagine that many will want to argue this point. Still the proof is in the photo and you are welcome to view my flickr account and see the images that I have captured. Most of the images show the scope that was used. If the degree of temperature change doesn’t work for you, then by all means try the temp. compensation method. I think that Charlie’s idea of checking the focusing data is a good one if you want to try temperature compensation. I’ve tried some of maxim’s tcomp and I never could get it to work. This is probably the reason why I have not used it in SGP, but I have to say that Charlie’s idea intrigues me. You can see the first sub was at focuser position 38680 @ 23.72 C and the last sub was at focuser position 30559 @ 2.95 C. So the change in focuser position was 8121 steps and the temperature drop was 20.97 degrees C. So the temperature coefficient from this data is 391 steps / degree C. Note that the focuser moved “in” as the temperature dropped so the TC is actually -391 steps / degree C.
One issue with the temperature probe being in the focuser is that it is the OTA that contributes the most to the image plane shift, so having the temperature be monitored on the OTA will be the most accurate – that’s why the reference to wind protection. I have never checked the log to see if the image history data is saved in the log. The displayed data above comes from the SGF file used to capture the data. Makes sense and I can see why this data would be more accurate than the training routines. Based on the above discussion I’m hoping my new scope holds focus well so perhaps I won’t have to bother with temp comp. Unfortunately it will be a few months before I get the scope. Joel, temperature compensation is more complicated than most users understand. Both the tube and the optics (whether lens or mirror) are affected by temperature, and usually in opposite directions (that’s why the temp coefficient is often negative). However, they don’t change at the same rate due to differences in mass and exposure to the air. TC usually works well and is fairly easy to calibrate if the temperature changes gradually. Personally, I have never developed much confidence in auto-focus routines, but they certainly can work and are a much more general solution to the problem. There is the special case of focus adjustment in the middle of long exposures (as in narrowband imaging, for example). For that, you would really like to use TC (even if it is not precisely calibrated) during the exposure and then auto-focus or manually focus between shots. However, you can only do this with a top quality focuser. The typical stock focuser that comes with a telescope is likely to shift when the focus motor moves, so you are limited to focusing between exposures. For my refractors I initially adjust focus with a Bahtinov mask, then enable TC. If the temperature changes rapidly I will check focus again after a 2 or 3 degree change. With my SCT I’ve never been able to get a reliable coefficient because temperature changes affect the scope in very complicated ways, so I use an “under-stated” TC coefficient, then check focus frequently. I am using the Optec Gemini with the AP Honders. Temp comp works perfectly. I have the temp probe right on the mirror. I used TC on my AT111. With TC I can refocus after 2-3C temperature drop. And I dont refocus/TC on temperature rise as it barely change focus.